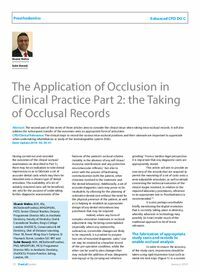 Abstract: The second part of this series of three articles aims to consider the clinical steps when taking intra-occlusal records. It will also address the subsequent transfer of the outcomes onto an appropriate form of articulator. Clinical relevance: The clinical steps to record the various intra-occlusal positions and their rationale are important to appreciate when undertaking rehabilitation or study of the stomatognathic system (SGS). Author notes: Shamir Mehta, BDS, BSc, MClinDent(Prostho), MFGDP(UK), FICD, Senior Clinical Teacher, Deputy Programme Director MSc in Aesthetic Dentistry, Faculty of Dentistry Oral & Craniofacial Studies, King's College London (FoDOCS), Conservative & MI Dentistry, Unit of Distance Learning, Floor 18, Tower Wing, Guy’s Campus, St Thomas’s Street, London SE1 9RT and Subir Banerji, BDS, MClinDent(Prostho), PhD, MFGDP(UK), FICD, Programme Director MSc in Aesthetic Dentistry, (FoDOCS); Private Practice, Ealing, London, UK. Objective: To understand the practical steps and principles involved when taking occlusal records.